The Death Valley Day Tour from Las Vegas is a full day of sights, scenes and extremes you can only comprehend once you are there. The world has many strange places but none quite as strange, as beautiful and as deadly as Death Valley. You have the luxury of experiencing it in the comfort and safety of modern, air-conditioned vehicles. Depart Las Vegas at 7am for your day tour to Death Valley. Your first stop will be the ghost town of Rhyolite, at the entrance to the National Park. This long abandoned gold mining community has been used as the set for many movies and documentaries. You will then be driven down a beautiful winding highway and enter the center of Death Valley from the east; this is like entering a foreign and strange world of endless desert, vast valleys, harshly sculpted peaks and superbly adapted plants and animals formed over millions of years. 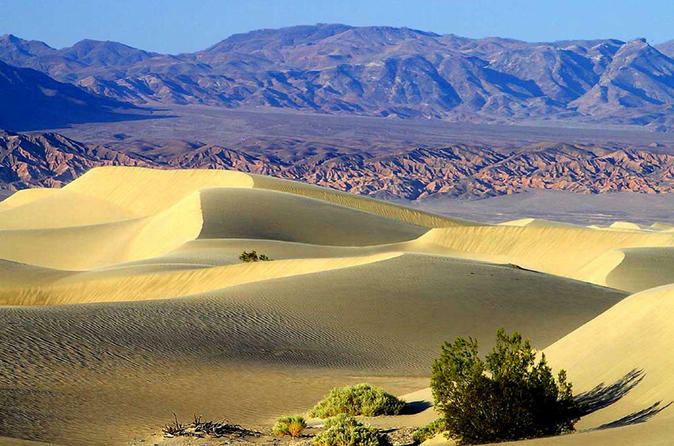 Death Valley, the driest, hottest climate imaginable is an immense, wild land that man has never tamed. Capture the view of the valley from Hell’s Gate, well above the valley floor and then visit Badwater at 282 feet below sea level. You will also enjoy views and stops at Zabriskie’s Point, the Devil’s Golf Course, the Furnace Creek Museum, the Salt Lake, the Sand Dunes and Artists Pallet. The majestic mountains, colorful canyons, volcanic craters and salt pinnacles all make this trip a photographic-sightseers dream come true. For the truly adventurous, this tour is offered your-round! Special Offer - Book and save 8% compared to the local supplier's prices! - Book Now!